Verily William, the adventure thou and myself shall partake on will be most excellent. All I can say is, dude's hair is bogus. Also, doesn't it sort of look like he's been sucking on a lemon? He has that slightly puckered look. If her were a modern person, I'd say he has the look of one who is saying 'Oh no she dit'int!' in his head, but he's not modern, so I'm going with the lemon-sucking puckered look. That's a real person, by the way. I can't say for sure if that's what he really looked like as cameras hadn't been invented yet, but all the pictures I can find of him tend to look somewhat similar. That man is,of course, none other than Nicolaus Copernicus. A very famous astrologer. More famous than Miss Cleo, even! Ok. I've just been informed that he was not, in fact, an astrologist. He was an astronomer. And we all know astronomy and astrology are two totally different things that have to do with stars. One tells your future from the position of the stars, and the other is actually based on fact and not guesses. Before we go any further, I must remind you all what day it is. It's the third of November. Two days after the first of November, which is the birthday of someone who reads these posts, but I'm not going to say who, because I don't have their permission to call them out for being old. But hey.....I remembered the date of the birth of one of my readers, and therefore, I remembered! Ta-da! Anyway, today is about Copernicus. Sort of. Not really, but sort of. 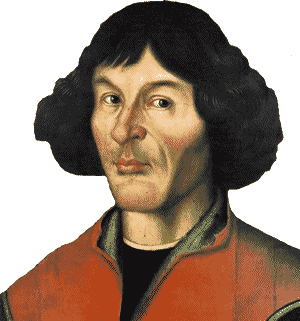 Most people know of Copernicus because he is the one who came out publicly against Ptolemy and the church by stating, unequivocally, that the Earth is not the center of the universe, and in fact, the Earth orbits the Sun, not the other way around. Anyway, the church really disliked the fact that Copernicus preached heliocentrism and not geocentrism. In 1616 the church made it heresy to say the Earth moved and the Sun didn't. To his credit, though, Copernicus never stopped believing in his idea. Too bad the church was right and Copernicus was wrong. I don't mean the church was right about the Sun orbiting the Earth. No, I mean the church was right when they said Copernicus was wrong. You see, the Earth does not, in fact, orbit the Sun. It only looks like it does. The Earth, and the rest of the solar system, in fact orbits something called the Barycenter. The Barycenter is the actual center of mass of the solar system. And that's not the Sun. In fact, the Sun also orbits the Barycenter. The reason it seems like everything orbits the sun is, the Barycenter is very close to the Sun. In fact, most of the time, it falls within the radius of the sun. But about 1/3 of the time, the Sun does not encompass the Barycenter. This means the Sun, and everything else in the solar system, orbits around an empty spot in space. Co, church wrong, Copernicus wrong, otter right. Always trust the otter. After all, otter knows best, right? So my minions, (one of which is now a year older...), do I lie, or am I telling the truth?